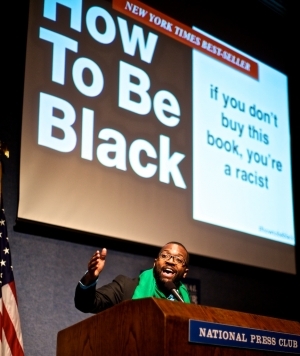 Baratunde Thurston of Jack and Jill Politics and The Onion, discussed his satrical book, "How to be Black," at a National Press Club Book Rap, Feb. 13. Before a very large multi-racial crowd, Thurston spoke about his 30-plus years of being black. He talked about his family background in a bad neighborhood in the District of Columbia. There was much laughter as he talked about "How to be the Black friend," "How to speak for all Black people," and "How to celebrate Black History Month." However, not all of Thurston's youth was happy. His father was a murder victim. Thursdton once set-up a panel of three black men, three black women and a white man. He asked the panel to answer questions such as: Did you ever want not to be Black? When did you know you were Black? and Can you swim? Thurston was introduced by Emily Whitten of the Young Members and Book and Author Committes. Books were sold and signed by the author as a fundraiser for the NPC's Journalism Institute.